This is the real reason for voter suppression. It will ultimately fail. I can hardly wait to see the day when the South changes demographically enough to become blue. Texas does not have a long way to go. I really want to see it happen to Georgia. LOL I will laugh my behind off. Mayor Bloomberg: NYPD ‘Stops Whites Too Much And Minorities Too Little’ - "“Mayor Bloomberg needs a math lesson. The NYPD’s own data shows that only 11 percent of stops last year were based on suspicion that the individual has committed of a violent crime. More than half of the stops were based on ‘furtive movement’ a catch-all category that encompasses all sorts of innocent behavior. 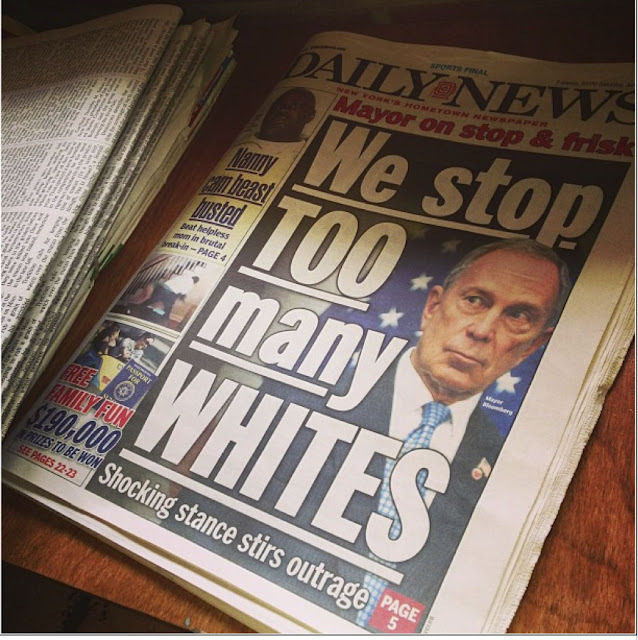 But perhaps the most compelling fact is that since Mayor Bloomberg took office in 2002, nearly 9-10 of more than 5 million police stops were of completely innocent people. That is some truly troubling math." People like Bloomberg need to be heckled and followed wherever they go. Give them peace. Let them know how it feels to be harassed. All In : Killing the Voting Rights Act - Chris Hayes argues that John Roberts' Supreme Court is trying to kill Section 5 of the Voting Rights Act without admitting that that's what they're doing. He is joined by Congressman John Conyers, D-Mich., as well as Debo Adegbile, who argued the case before the court, and Julie Fernandes of the Open Society Foundations. "Gideon’s Army": Young Public Defenders Brave Staggering Caseloads, Low Pay to Represent the Poor | Democracy Now! "New federal data, included in a study by the American Civil Liberties Union, now shows that the problem of racially biased arrests is far more extensive that was previously known — and is getting worse. The costly, ill-advised “war on marijuana” might fairly be described as a tool of racial oppression." Google pressed the government to allow it to publish more granular data on national security requests than Facebook or Microsoft published, and said anything less did not provide enough transparency. We have always believed that it's important to differentiate between different types of government requests. We already publish criminal requests separately from National Security Letters: http://goo.gl/OCFck Lumping the two categories together would be a step back for users. Our request to the government is clear: to be able to publish aggregate numbers of national security requests, including FISA disclosures, separately. Man Cuffed On DUI Charge After Testing 0.000 On Sobriety Test. The Price For Being Black In America. How can someone be charged with DUI and not have a drop of alcohol in his or her system? It’s something that has puzzled Jessie Thornton (pictured) since the night he was pulled over by officers from the Surprise Police Department in Surprise, Ariz., last week. According to police documents obtained by KNXV-TV in Phoenix, Thornton was pulled over because he crossed the white line in his lane. An officer allegedly told him that he knew he was driving drunk because of how Thornton’s eyes looked. The 64-year-old retiree from Ohio says his eyes may have been red because he had just finished swimming at a local fitness center. Melissa Harris-Perry: How can you train a force to police without profiling? America can be a horrible country to live in. There are a lot og ignorant, dumb, racist cops with guns. They are very dangerous. Something must br done about them. Sybrina Fulton hasn’t been able to visit her son Trayvon Martin’s grave site since the Florida teenager was buried 15 months ago. “In my mind, I don’t believe he’s there. I believe, and I want to believe, that he’s in heaven, and I just want to believe that he’s looking down on me, and he’s smiling and he’s the one that’s helping God to help me move forward,” she told me in a nearly hourlong interview Wednesday morning in a New York City restaurant. In that hour, Fulton talked openly about her pain, her loss, her hopes for the trial, her new role as a public figure and her overarching faith. She is preparing for Monday, when George Zimmerman will go on trial for killing her son. Zimmerman claims that he shot and killed the unarmed teenager in self-defense. The prosecution — and Trayvon’s family — contend that Zimmerman profiled the boy, pursued him and murdered him. Joint Chiefs’ Testimony on Sexual Assault Dismays Senators. This is why you cannot trust any military or paramilitary force like police officers to supervise themselves. The very nature of their organizational structure fosters tribalism, corruption and cover ups. These organizations are necessary but they are inherently a necessary evil. The US military has refused to release transcripts of Bradley Manning's trial. In addition, they've denied press passes to 270 out of the 350 media organizations that applied. Without public transcripts or a press pass, it's virtually impossible for media organizations to accurately cover the trial and for the public to know what the government is doing in its name. In response, Freedom of the Press Foundation has crowd-sourced funding to place a professional stenographer in the media room covering the trial. We will post full transcripts shortly after each day's proceedings end. The morning session with be posted by 7 pm the same evening. The afternoon session will be posted by 9 am the next morning. The transcripts will be released under an Attribution 3.0 Unported Creative Commons license. Hardball: McCaskill: You don’t confront sexual assault in the military by ‘just training’. These sexusal predators and the officers which have condoned this behavior need to spend at least twenty years in jail. Commanding officers should have absolutely no say over prosecutions. John McCain: Women should avoid military service until sexual misconduct crisis solved. Is McCain insane? Women should pay for the incompetence of the male military brass? But a defense lawyer for Private Manning told the judge that his client had been “young, naïve, but good-intentioned” and that he had, in fact, tried to make sure that the several hundred thousand documents he released would not cause harm. Traitor or hero whistleblower? Court-martial is set for Bradley Manning - U.S. News: "Pfc. Bradley Manning says he was driven by an unquenchable thirst for information and wanted to show the world the truth about the American wars in Iraq and Afghanistan. The military says he helped enemies of the United States. Now a judge will decide his fate. Manning, a 25-year-old former Army intelligence analyst, goes on trial Monday in a military court at Fort Meade, Md., for his release of hundreds of thousands of secret documents to WikiLeaks, the anti-secrecy website." The District of Columbia's planned public school closings disproportionately affect minority and special needs students and there is no evidence the plan will improve educational outcomes or save the district money. Dressed in their Ferebee-Hope cheerleading uniforms, McKea and her teammates were accompanied by Shannon Smith, who has two grandchildren at Ferebee-Hope, one of 15 schools slated for closure by DC School Chancellor Kaya Henderson. Smith led the children to a rally outside the E. Barrett Prettyman Federal Courthouse, where several DC parents, students and activists had gathered to support a lawsuit against the closings. It turns out that all 15 schools are located east of Rock Creek Park, an unofficial dividing line between poor minority communities on the east side and affluent white neighborhoods west of the park, leading to allegations that school closings are an attempt to privatize public education at the expense of the city's most vulnerable residents. The question is how much longer he’ll be able to straddle. Weiner’s professional political life began in 1991, when he ran his maiden race for City Council. As Steve Kornacki detailed for Salon, he won a long-shot bid as a 27-year-old, in part by anonymously sending mailers linking his opponent to African-American figures (namely, Mayor David Dinkins and Jesse Jackson) unpopular in his white district. Appealing to the white ethnic constituency, he cultivated an identity in office as an outer-borough moderate, focusing on issues like graffiti, airport regulations and fire alarm boxes.